13 mm white sapphire faceted face (supposedly) with 2 side diamonds at 5 mm each. I just purchased this from the jewelers as an estate piece. It was in the store for quite some time and all that time I had admired it. I really like it so it really doesn't matter if it is made out of mud. But, I would like to know what model it is. There is nothing that the jeweler knows. I purchased it for 1/2 what he wanted for it, so of course I think I have a bargain. I just hope that I do. What do you think I have? Hi All, thanks for trying to figure out what this piece is. It is baffling me. However, today after doing strenuous exercise, I had found that the back and the casing had fallen out of the watch itself. After frantic searching, I found it. I was able to take a picture of the inside workings, and maybe this can shed more light on the subject. Thanks again for all your help. Help me realize if I got a deal or not. What is the model? I can't find it anywhere!!! You would think if you typed in all the info somewhere, you would see something, but nothing. I hope that you all can help. Takka2 - It appears that we do not have an ad that matches your beautiful watch. It's similar to a model called "Golden Centennial", the difference being the two diamonds, the GC is not shown with them. Until we find something that matches, I would have to call this one "Unknown". We do not have the wherewithal to do price valuations but If you think you got a deal then I declare that you did. I often say that an object such as a vintage watch is worth as much as someone is willing to pay for it. 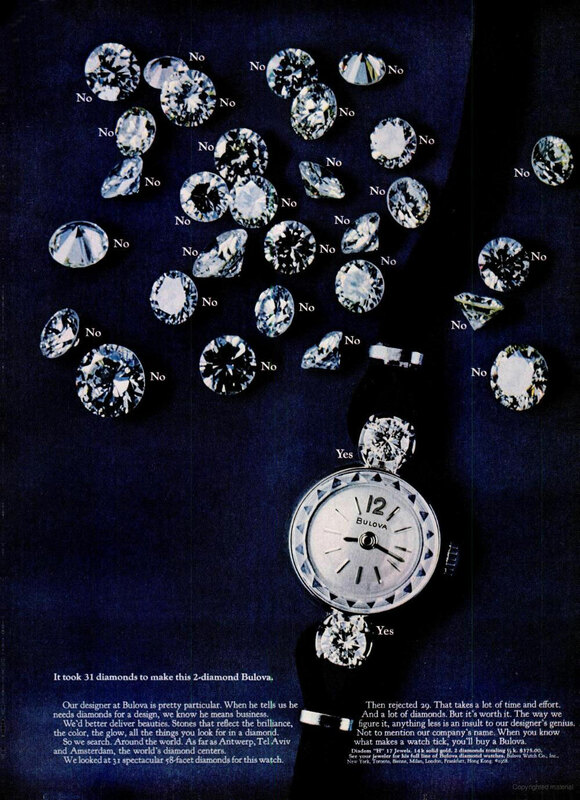 How are We determining the Jewel count and a 1973 date of manufacture? I agree with Fifth, the subject watch sure looks like the Diadem right down to the faceted crystal. A photo of the movement & case back will help verify the year...its possible Bulova called it something else in 1973 if that is what the year is. Tenative Diadem subject to jewel count and date of mfg. I think Mark's nailed it as the "Diadem" regardless of the details as it's dead on with the ad. If it was a successful model they would have produced it over a few years as they did with the American Girl line. Thanks all with your help. I do not have the capability to take off the back personally to determine movement. So I Will take your word for it as you are experts! If I ever get the back off, I will take pics. Thanks for the ad bit looks just like the watch except for the black band. If the watch is yellow gold it would not be strange to have the gold cord band. The watch in the ad is white gold and a black cord was commomly used with the white. Thx for posting such a beauty. It is a Diadem case no doubt but we still don't know about the movement. It is quite possible it is ok but we haven't named a watch based on the case only that I am aware of. My vote stands as stated. Strange turn of events . I was conducting strenuous excercize and realized that about 1/2 hour into it that the back and casing fell out of my watch face and diamonds!! I did find them after lengthy search, but I was able to take pictures of the back and the inside of the caseing and movement so I have updated it. Please check again ... Maybe this can help you.